Timeless beauty is what you'll get as you wrap your wrist with this bracelet. 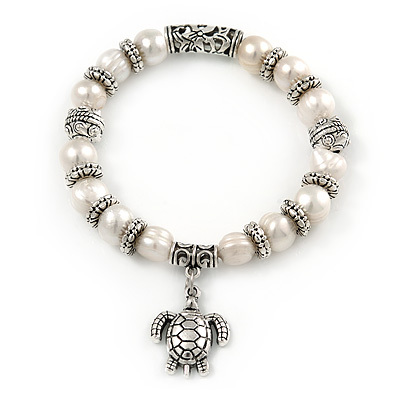 The bracelet featuring 10mm off round cultured pearls decorated with a turtle charm and hammered metal rings provide elegance and versatility. Flex design ensures easy wear (up to 18cm). The charm is about 25mm long. Pair it with your favourite jewellery pieces to the office or dinner with your loved one. The possibilities are endless.